No matter how hard I try, I could not recall my experience with using WordPerfect more than ten years back. I can recall using it for months but the overall user experience escapes me. It puzzles me. After all, I can still recall some of the keyboard commands for the DOS version of Word. COREL WORDPERFECT LIGHTNING. The free note-taking software is easy to use and comes with an online collaboration account that allows you to synchronize notes. 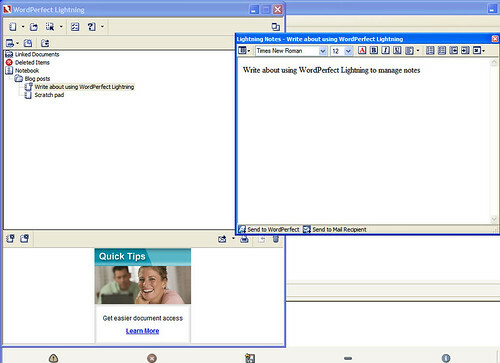 But a link in del.icio.us not only reminded me that I once used WordPerfect and that the software suite still exists, it also pointed me to a cool free product that I have been testing for days now–WordPerfect Lightning. Corel got the “lightweight” claim part right. The initial installer download is less than 1MB albeit it downloads more files as it installs the software. This setup is puzzling because Corel says “WordPerfect Lightning is simple, free and doesn’t need a Web connection.”” You may not need a Web connection to use it, but it appears that you need one to install it. I couldn’t find a standalone installer. Still, the whole installation process took less than 5 minutes in my PLDT WeRoam connection.